Abscure Games: Graphics: What's Their Value? While smashing down buttons on your controller, have you ever wondered what it would be like to play the very game that you are playing with entirely different graphics? Maybe it would change the mood. Maybe it would make it better to play. Perhaps you wouldn't even play it in the first place. Think about chess. 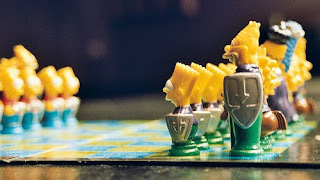 One of my friends has Simpsons themed chess pieces. It makes the game more casual, and you can't really be uber-competitive and serious when you are focused on keeping Homer alive. But the game's rules don't change. It's the same exact game. The pieces are moot. Different pieces, same exact game. So why do we care about graphics? I think it's how we pick what games we want to play. If I am scrolling through thumbnails on a Flash portal, I'm going to want to play the game that looks the coolest. Or, if I'm looking for chess pieces and I'm a serious player, I definitely wouldn't get Simpsons pieces. Let's say you have two games; one game will have childish, noob-looking graphics and the other will have clean, stylish Illustrator graphics. If you were playing the childish game, you'd probably be playing the game thinking about how the graphics are weird. That could get in the way of things. In conclusion, I think graphics are a necessity because other games have them. Having cool-looking art is just another way to one-up your competitors. Essentially, I think it's all relative; in this reality that we make games in, we need to have graphics so people take us seriously (for the most part.) Wouldn't it be cool if there was some parallel universe where games where just circles and squares and different colors to let you know what you're doing? Anyway, enough of my ranting. My points are probably stupid. I'm bad at this kind of thing. So I want to know what you guys think. Why do we care so much about graphics of games?